Who Do I Claim Compensation From? Why Should I Bother Making A Claim? 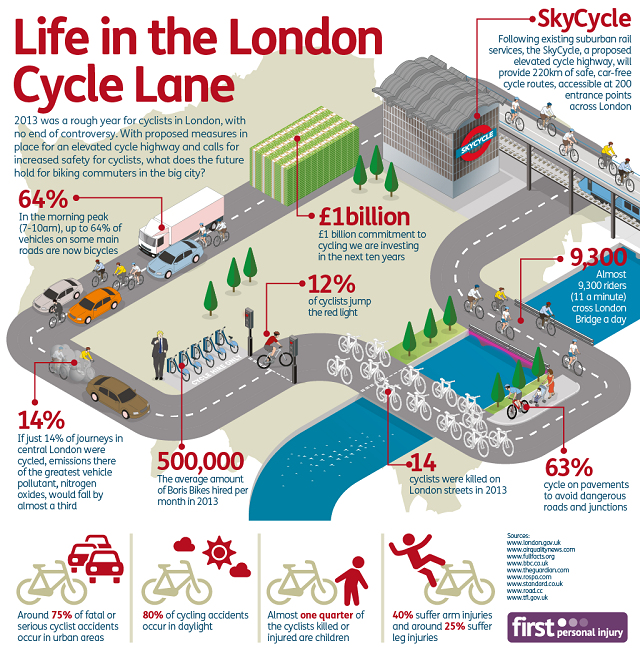 2013 was a rough year for cyclists in London, with no end of controversy. With proposed measures in place for an elevated cycle highway and calls for increased safety for cyclists, what does the future hold for biking commuters in the big city? Please include attribution to First Personal Injury with this graphic. Following existing suburban rail services, the SkyCycle, a proposed elevated cycle highway, will provide 220km of safe, car-free cycle routes, accessible at 200 entrance points across London. 14% – If just 14% of journeys in Central London were cycled, emissions there, of the greatest vehicle pollutant, nitrogen oxides, would fall by almost a third. Have you been in an accident recently? Call us on 0800 808 9740 or make a claim here. Contact or call us for free on 0800 808 9740 and speak with our team of injury lawyers. We’ll talk through the details of your claim over the phone, and then advise further! If we think you’ve got a valid claim, we’ll take care of everything else – quick & easy! It only takes 5 minutes of your time to get started! I’ve Been Knocked Off My Bike By A Car: Can I Make a Personal Injury Claim? *Please note – With regards to No Win No Fee - In limited circumstances, fees may be charged when your accident claim is not successful. These specific limited circumstances will be explained to you by your Solicitor. The Citizen's Advice Bureau says it's our "civil and legal right" to make an accident claim. But 69% of us don't make an accident claim. Don't miss out on what's rightfully yours. First Personal Injury is a trading name of Jefferies Solicitors Limited. Jefferies Solicitors is a limited company registered in England and Wales under registered number - 07451340. Authorised & regulated by the Solicitors Regulation Authority and subject to the Solicitor's Code of Conduct details of which can be found at www.sra.org.uk/code-of-conduct.page.